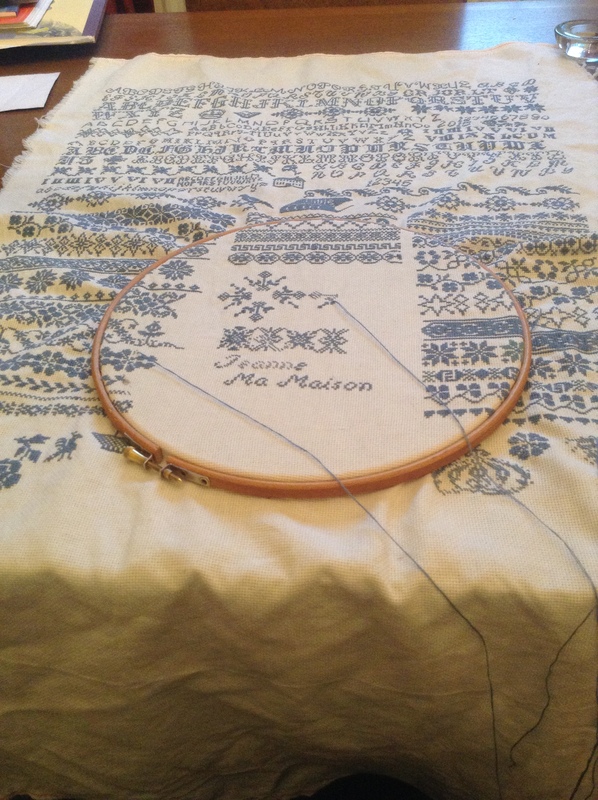 Just thought i’d give you an update on how my current Cross Stitch Work In Progress (Wip) is coming along. To the left is a close up of the lower right hand panel. As you can see there’s quite a few trailing threads and some of the items are currently only half, rather than full cross stitch. There is method in my madness, honest! I’ve done quite a few large pieces over the years, and have been caught out several times by spending hours or days on a section, only to find out that I’m a couple of stitches out either way. It’s meant much time is spent frogging, and having to restitch. 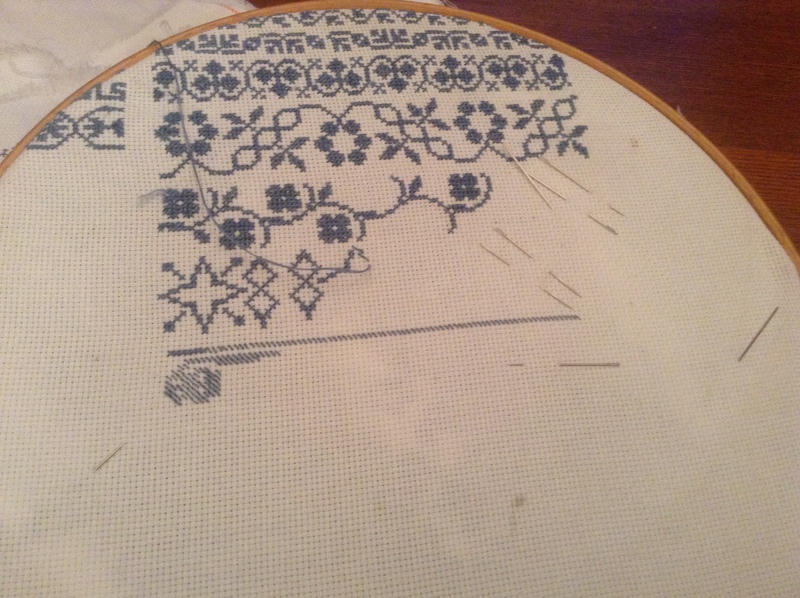 Therefore I half-stitch, make sure thi ngs line up appropriately and then fill the rest in. The picture on the right gives an indication not only of the size of the piece (it’s not going to be much longer), but also the section that I’m working on right now. It will have at least one wash between now and when it gets completed, then ironed and at some point I will also have it framed. I will then have to consider where I will hang it up in my apartment! (it has been known that I finish and frame a piece of a similar size, only to have someone drop unsubtle hints about how they expect to get it as a birthday present). this picture is just to show some of the things I use whilst doing a piece. The plastic folder keeps everything together so I don’t keep losing things. It primarily contains the pattern I’m working on, needles, threads and scissors. If I’m travelling then the WIP itself also goes in there. Also included in the picture are needles (some of which are threaded and ready to go, along with a pin cushion. That weird looking metal thing? It’s a light, same as a personal book light, that can be clipped to the frame and allows for up close and targeted additional light to the piece. I’m not reading much at the minute so I thought I’d share what I AM working on at the minute. This is known as the “Jeanne Ries” sampler (it can be brought from various places, including here). On the right is an image of one of the chart panels (there are nine in all). 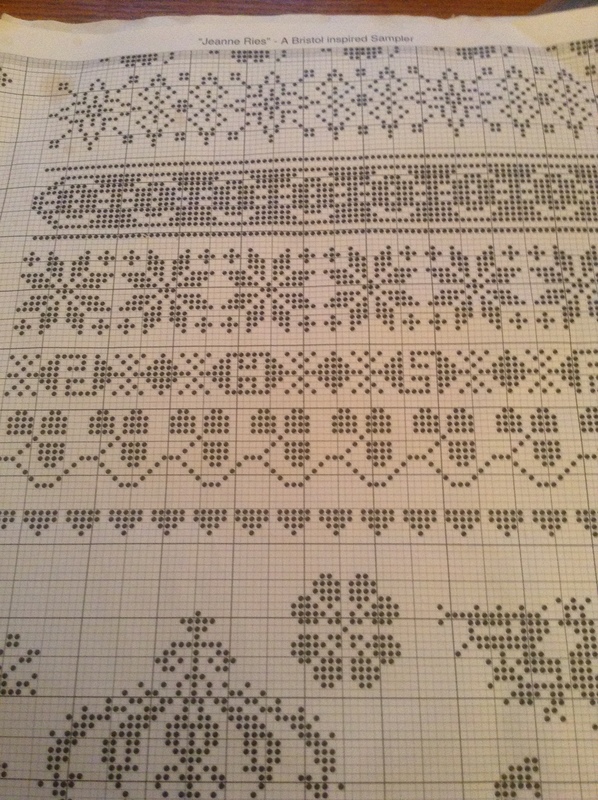 For those who dont do cross stitch, or know how to read one of the charts, every dot on a chart represents a single cross stitch to be stitched. Below (left) is a photo of my version of a part of the same page. These items are HUGE (30 x 18 inches). 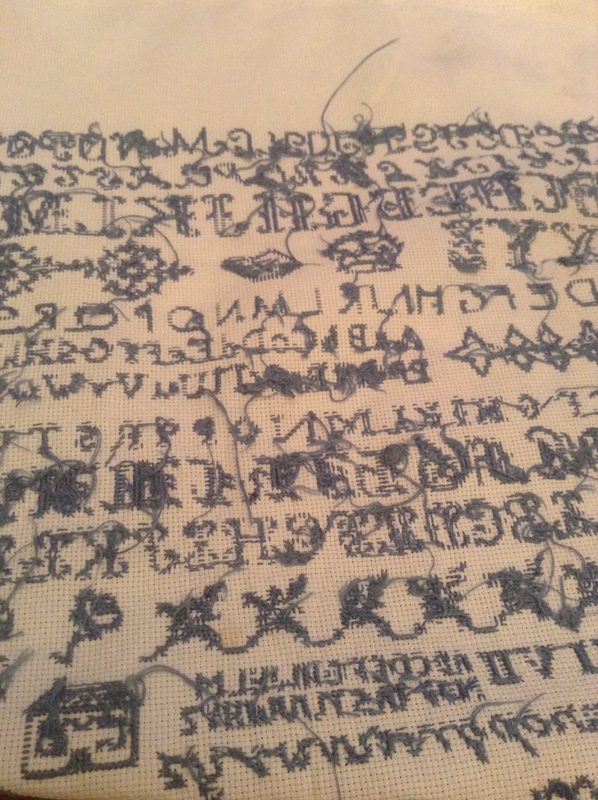 There is a lot of stitching, and it is very easy to get lost, go wrong etc. Sometimes it doesnt matter, but sometimes, missing a stitch can be fatal in having things join up and look good. 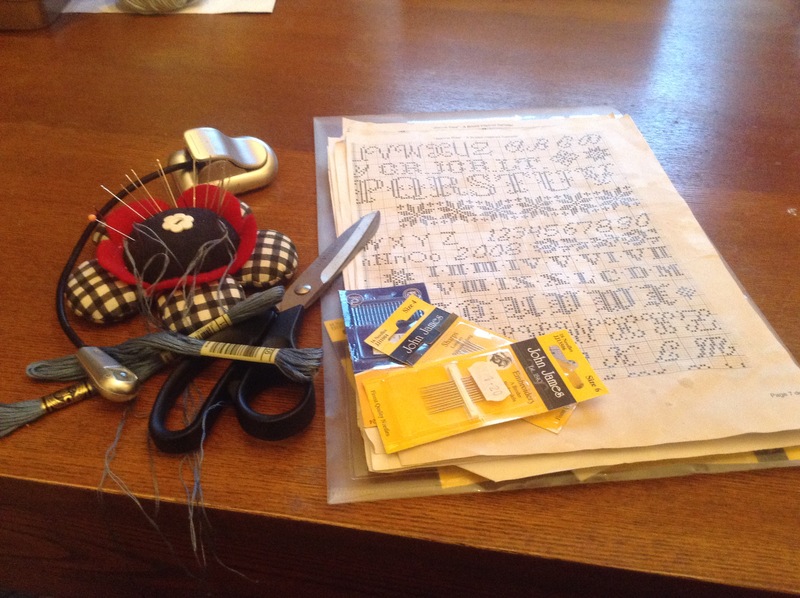 Therefore I often stitch the outline (i.e. half the stitch), make sure it lines up, and then fill in the rest of the stitching when I’m happy. These items are HU GE. Therefore there is a lot of “Baggage” when stitching something like this – the 9 sheets of design, the needles, threads etc. It takes up space. If I’m going away for instance, and I know I will have stitching time, but it will be limited, I dont want to take the entire WIP bag with me. 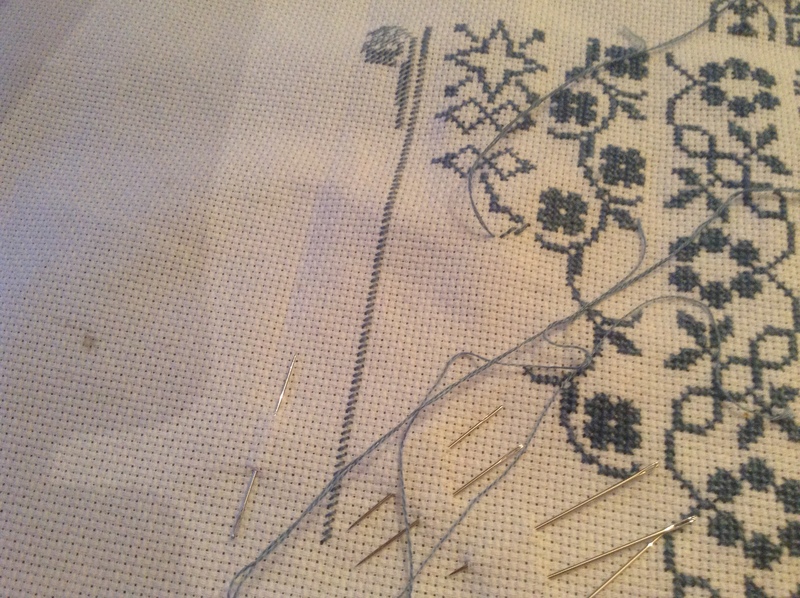 If I have done the ground work, I can just bring the piece, needles and enough thread to fill the time. I dont need to bring the design etc, with the potential risk of losing a sheet of the pattern. As you can see in the photo, I have also parked my needles in the wip itself – that way I dont have to bring needle cushion with me either. On the right is the same area of the stitching mounted up on a frame. This frame is about 8 inches, and allows me to work on a specific area, keep it tight, and therefore allow for the stitches to have the same tension. This is the back of my work. There are snobs out there who look at the back of sewing, then deride the stitcher if the back doesn’t look as good as the front. Well you know what? That’s unbelievably rude. I do this out of enjoyment; I give because I want to. I do none of this to have someone else come in to criticise me. 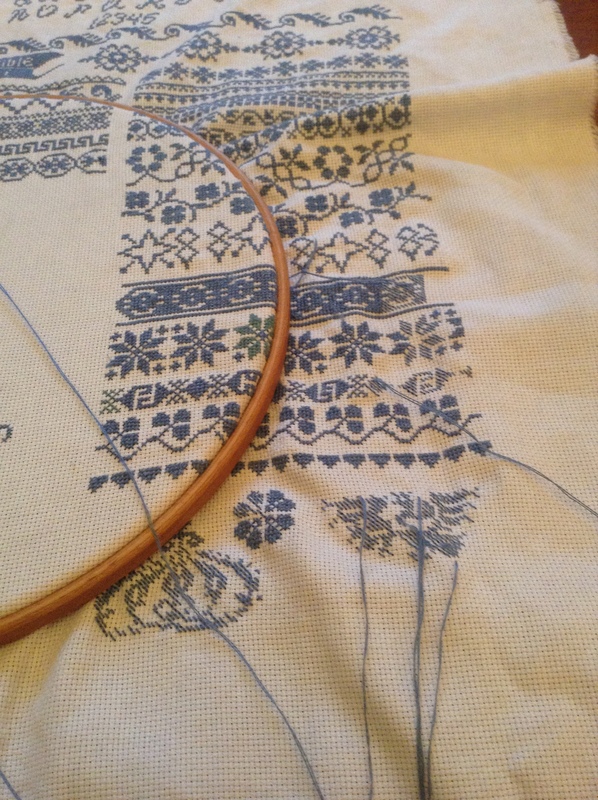 Once I have finished, I will go and cut extra threads away and do a general tidy up – I once forgot to do this, and the threads were visible once the item had been framed up – never again! My other main hobby is crafts, and I currently have a couple on the go. I’ve had a stash of fabric that’s been following me around for years. The bulk of it was a set of quilting fabric that I picked up from a company called Laura Ashley, in what must have been the early 1990s. I think it’s followed me through 2 countries and 3 houses, so a few months ago I bit the bullet and started doing what’s known as “paper piecing”. At the moment there are several large squares of fabric (made up of 16 smaller squares) sitting on my dining room table. Sooner or later I will have to join them together and make something (though right now not sure what, beyond some kind of quilt top). There is also other piles of fabric stash lying around the place (one of the reasons I decided I had to do something with the stuff I had). Some of this is specific from patchwork/quilting companies, and some have just been from shirts etc that have died a death and are otherwise no use to anyone. Again, as with many crafters, I am a bit of a hoarder here and simply need to get around to using it. I’m a sucker for making large pieces in cross-stitch, many of which have been given to family or are currently hanging on my walls. I have one Work In Progress that I started at least a year ago, am about 2/3rds of the way through and need to finish it, if only to stop it looking at me and guilt tripping me for ignoring it! Once in a while I get a fad for knitting – something that proved useful when I was sick and couldnt see well enough to read or do sewing. At least I didnt need to see to feel my way round a set of knitting needles! What about you? What are your non-reading hobbies? 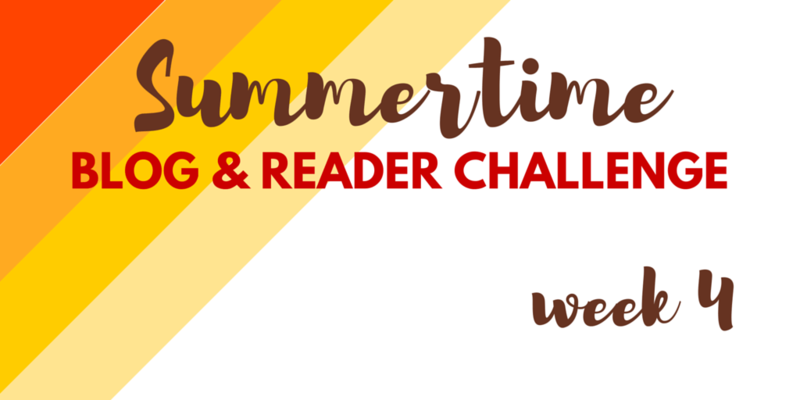 It’s week four of Parajunkee’s Summertime Blog & Reader Challenge, where the week is about moving further away from books and blogging about the things we enjoy, other than reading. It’s Post 14 and we are allowed to post a Random Non-Book Related Post. I’m seeing a lot of internet traffic (primarily from the US, naturally) about marking significant moments such as 9/11, often by making quilts or using some other crafty skill. I was just wondering how you marked an occasion, either good or bad? Do you make anything for weddings, christenings, birthdays, major holidays (Christmas, Passover etc), funerals, passings etc? I’ve made some things for family: a large sampler for my cousin’s 40th; a cross stitched cushion cover when my first niece was born; a Lavender and Lace sampler when my brother got married; a copy of a photo for my sister’s birthday. My mother has also had several large cross stitch pieces given to her for birthdays etc, when she’s seen it in progress and expressed interest in having it. And of course, there’s a whole industry around Christmas, which often starts in July!